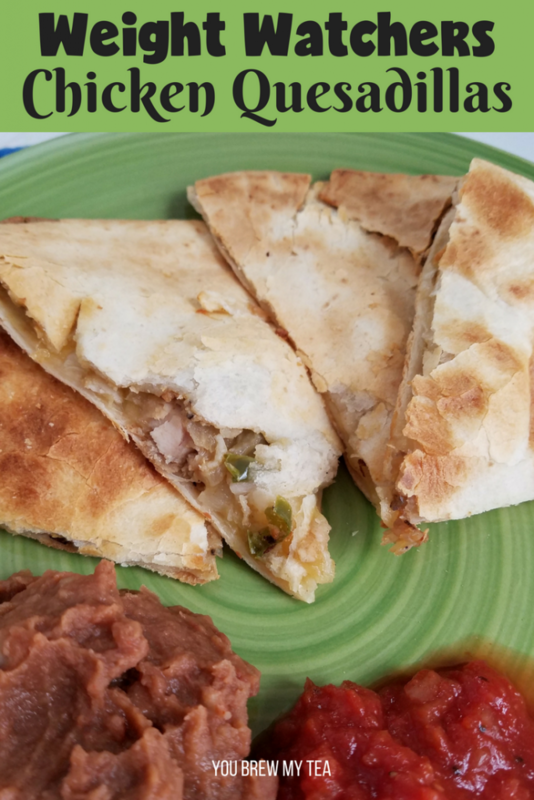 This Weight Watchers Chicken Quesadilla Recipe is definitely a favorite easy meal that the whole family loves. I have actually been making this recipe since I was a teenager. I just made a few changes to make it a bit more Weight Watchers friendly, and now I have a meal that everyone loves and can easily fit into my meal plan. While you can cook this at the time you want to eat, I highly recommend doing some batch cooking in advance of things like chicken and your bell peppers and onions. If you cook in large batches, then portion and freezer or refrigerate if using in the same week, it saves tons of time. I often follow the tips in Alea Milham’s book Prep-Ahead Meals from Scratch to help with my batch cooking. Note: I use Ole Xtreme Tortillas for this recipe as they are large, tasty, and only 1 SmartPoint each. Additionally, I choose to use 2% cheddar, but if you want a lower point quesadilla you may choose fat-free cheese. I find higher fat melts better, so prefer to use it. In a large nonstick skillet or wok, heat 1/4 cup water along with bell peppers and onions. Cook on high for 5 minutes until translucent and tender. Add the diced chicken, cumin, garlic powder, salt, and chili powder. May add more water if needed to prevent sticking. Cook chicken and vegetable mixture for 5-7 minutes or until chicken is cooked through and no longer pink. Place tortilla on baking sheet, and scoop 1/4 vegetable and chicken mixture onto one side of the tortilla. You will be folding the tortilla in half to form a half moon, so add the mixture to a single side. Sprinkle 1/4 cheese onto mixture and fold tortilla over to form a quesadilla. Continue process with all 4 tortillas. Bake at 375 degrees for 15-18 minutes, flipping halfway through cook time. In a large nonstick skillet or wok, heat ¼ cup water along with bell peppers and onions. Cook on high for 5 minutes until translucent and tender. 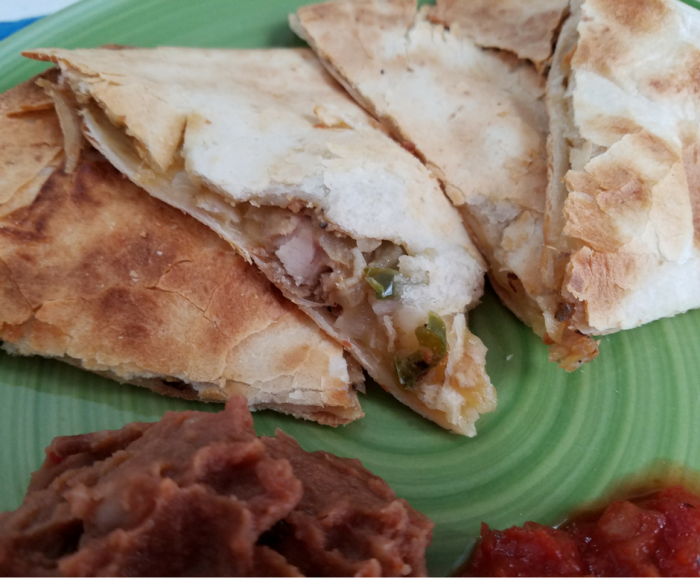 Place tortilla on baking sheet, and scoop ¼ vegetable and chicken mixture onto one side of the tortilla. You will be folding the tortilla in half to form a half moon, so add the mixture to a single side. 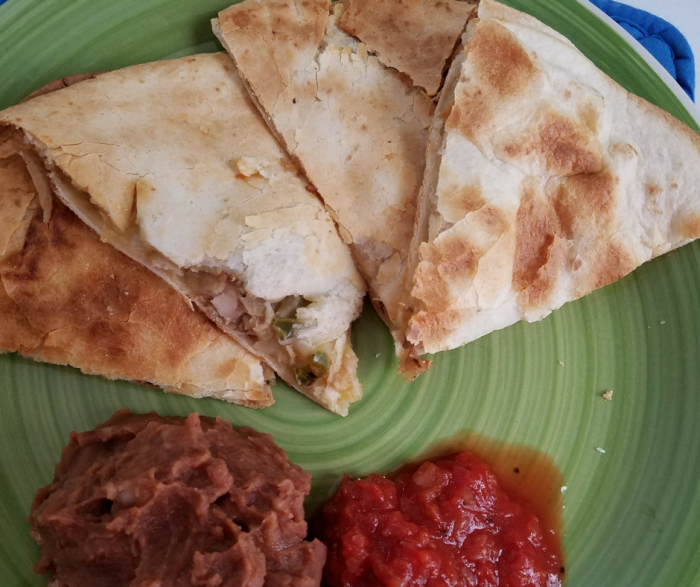 Sprinkle ¼ cheese onto mixture and fold tortilla over to form a quesadilla. 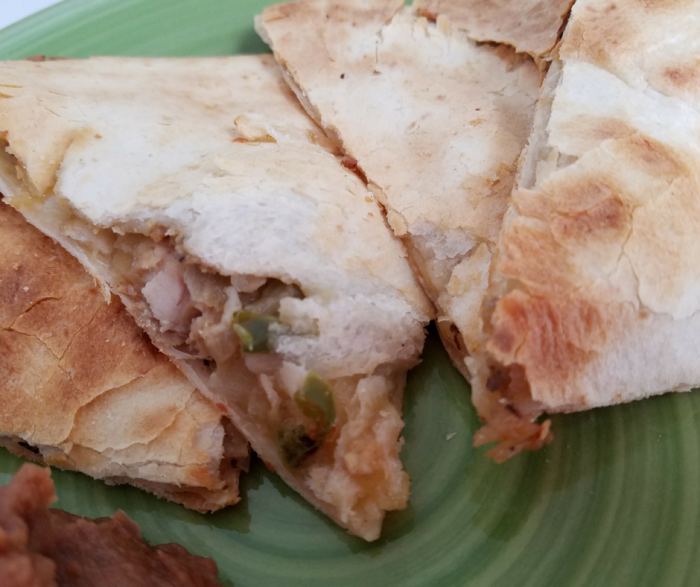 Making our chicken quesadilla recipe is sure to please the entire family. I love recipes like this that are easy to serve alongside zero point refried beans and salsa. They are satisfying, while not adding tons of points or calories to my day! I tied this last night. Baked according to directions, tasted great with the exception of parts of my quesadilla were hard. Maybe some olive oil spray would help, not sure going to try that next time. The tortilla needs something to prevent drying out. Thx for the recipe.